Horses have made me a better person. Definitely, positively. Indisputably. They are telling me. My family and friends tell me. I can tell. Not that I was a bad person before. 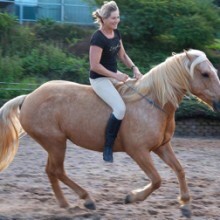 And in the realm of horsemanship, I have always treated my horses well and looked for more considerate, softer and natural ways of training them. Over the ears I discovered natural horsemanship, bitless riding and barefoot trimming. My five horses live together in a herd so they can hang out with each other, groom each other, run and play with each other and experience the social interaction so vital for their well-being. They live as a cohesive herd as close as is possible in captivity. When my daughters grew up and moved away, I was left with their horses and also an opportunity to grow into new ways of Being with my herd. I was already pretty happy with my Doing and how I am forever willing to learn, change and expand. I seized the day to further explore Being with horses. And Being with nature. Horses and Nature are gifted in guiding us back to our Authentic Self with humbling acceptance and pure integrity. When I gave up ego centered training and began to go to my horses with genuine inquiry such as “What will we learn from each other today?” and “What wants to happen?” obstacles turned into challenges which became stepping stones. The door into the world of magic with horses flew wide open. Now the journey is the destination and each moment is filled with wonder, joy and gratitude. Horses are powerful teachers on the journey back home to our true nature. Many years ago, during a Virpassana Retreat, I had the opportunity to ask a Japanese Zen Buddhist Monk one important question. My question was: “What is sin?” He answered: “The only sin there is, is not to be happy.” Our true nature is Joy. At this time the horses are intentionally choosing to work with humans to help raise awareness, remove energetic blocks, increase energy levels, recreate balance and lift our frequency. At Aurora Valley Take Time to Smell the Horses near Bangalow, Northern NSW, the horses have truly stepped into their roles as energetic healers channeling their connection with Creator and the Divine. EDITOR’S NOTE: Beate is also the creator of The Authentic Voice Cards. With stunning visual images capturing the spirit of horses and nature combined with a good dose of common sense, they offer a practical approach to spirituality and a focus on heart centered emotional intelligence. 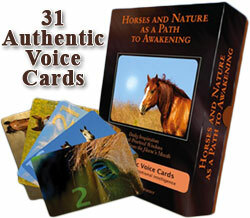 This unique deck of cards make an excellent tool in the hands of nature lovers, horse lovers, practitioners and participants of Equine Therapy, those on a spiritual path and anyone on the journey back to the heart and to wholeness.